I really do not want to hear ANYONE from the cushy private boxes to the bleachers complain about steroid use in the professional game of baseball anymore. Minor league fans have just affirmed what the owners of baseball know: You run your mouths about steroids, but the minute that a fallen major league superstar shows up in your town, your principles go out the window, the ticket window to be exact, in the form of a loud “Ka-CHING” of the club’s cash registers. 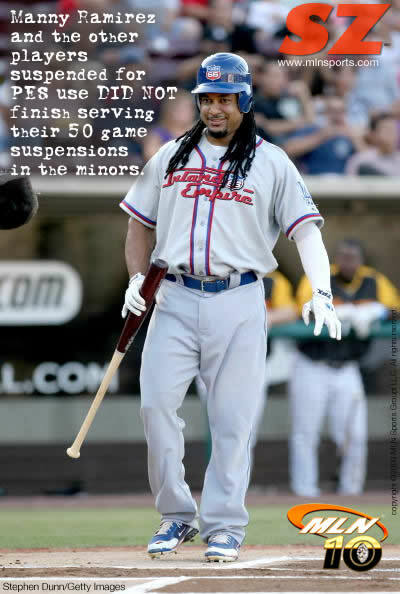 The “rehab” tour of steroid cheat Manny Ramirez continued last week (See the story at MLN – The Raw Feed, 06.28.09) to sold-out crowds in Lake Elsinore, Calif. and in San Bernardino, Calif. The steroid cheat even pounded one out of the park heading for Lake Elsinore for the adoring crowd on the 28th. On the roster with the Inland Empire 66ers last week, whose cash register bells rang loud enough to provide angels with wings through Sunday, Manny Ramirez dropped down to Class-A ball for a short stint after spending a couple of regrettable games with the Triple-A Albuquerque Isotopes on his hall-of-shame tour. Most rehab players are working on an arm, a leg, an ankle. Ramirez is working on re-establishing legitimacy, and you dear fan, are handing it to him on a platter. Ramirez, talented as he is, belongs on a golf course, or in a card game with Barry Bonds, Mark McGwire, and Sammy “the Corked Bat” Sosa. He has no place in baseball anymore. The “new” drug-testing, and suspension system which was a deal with the devil, er, Players Association, be damned. If you love baseball, Manny MUST GO. Until they make a big public example of a destroyed career, steroids are here to stay. As long as you know you get a mulligan for a first offense, it is still worth the risk. Thanks to the Commissioner of Baseball, Bud “Light” Selig, the worst thing that happens to you if you get caught taking steroids is that you get a less-than-paid vacation, some counseling, and a run through places like Lake Elsinore or Bakersfield to packed houses of cheering fans. Yessir, you can just feel how Manny is suffering. The problem is that Ramirez is likely not a first-time offender, but a long-term user who just happened to get caught in this particular wave of drug usage. Cheating in MLB-MiLB baseball is easy: As Chris Hadorn and I pointed out in “The Perfect Test” (SZ, 12.13.07) you could drive a truck through the Performance-Enhancing Substances (PES) testing systems used to catch offenders, because, quite frankly, not catching them produces a game that the owners seem to think that you want to see. Their viewpoint, of course, is reinforced by record-breaking attendance numbers for the rehabs of alleged or already fined steroids cheats like Clemens or Ramirez. The fact that you turn out and cheer on these bums every time they take the field sends a loud message: Joe Fan does not care about records, about history, or about the integrity of the games that they watch. Don’t let anyone cut the beer line in front, of you: That’s dishonest. Once you have your brew, though, you’ll be hoisting it to a Barry or a Manny or a Sammy because you came to see some home runs, baby. Yeah. The endemically corrupt MLB system in which Manny plays, is your fault. Why shouldn’t the owners turn a very blind eye to the destructive use of PES both on the game and on the oft-shortened lives of the players who take it? They respond to you, the fans, and you don’t really care. Who is going to stand up and say “enough!” to players who compromise the almighty statistics of this game? Will Minor League Baseball(MiLB) president Pat O’Conner grow a pair, and ban ‘rehab’ steroid users from play in the MiLB system? Not likely. MiLB is allegedly an independent umbrella organization for the professional minor leagues, but Pat O, a good Baseball Kremlin party man, takes his marching orders from Bud Light’s office. Will Ken Young, managing owner of the Albuquerque Isotopes, or David Elmore, the Inland Empire 66ers Owner/President, take a stand and ban Ramirez from playing in their park, putting themselves in the crosshairs of both O’Conner’s office and MLB? It is much easier to take the wheelbarrows of cash that flow in from Manny’s ‘rehab’ tour and say nothing. Therein lies the problem with drugs. Any drugs. They do not go away unless the consumers, YOU, send a message by NOT attending the exhibition of the drug users who you say in private are ruining the game. It could be that you don’t care. It could be that hours and hours of mock sports drama like WWE ‘wrestling’ has blurred the lines between sport and entertainment. Mostly I think you do not seem to be in the mood to achieve righteous indignation. You have watched the Lyle Alzados of football die from this stuff. You turned out in droves to watch Barry Bonds destroy Hank Aaron’s lifetime achievement. You have seen great careers and major records tarnished by it forever. You sat idly by after the Mitchell report. You keep coming out anyway. So if you think that the professional game of baseball is going to hell, you have had a huge hand in getting it there, my friend. When I can hear the crickets instead of screaming fans at the next park where Manny makes an appearance, maybe I will believe that you want to put an end to cheating in pro baseball. Empty a ballpark or two where Manny shows up, and Bud Light and friends will have to do something to protect the game from these ‘awful’ steroids cheats, ladies and gentlemen. You want to send a message? Stay home for Manny’s next appearance at any ballpark. Turn off the MLB Network for his games. If you love baseball, as you claim, stand up for your game! Republished with permission from the article at The MAJOR BLOGS of Minor League News. This entry was posted on July 4, 2009 by Brian Ross in Corporatocracy, MLB, Sports and tagged Baseball, Bud Selig, Celebrities, Celebrity, Drugs, Entertainment, Entertainment News, Ken Young, Manny Ramirez, Manny Ramirez Drugs, Manny Ramirez PED, Manny Ramirez Suspended, Manny Ramirez Tests Positive, Manny Steroids, Manny Suspended, Milb, Minor League Baseball, Mitchell Report, Mitchell Report Baseball, Mlb, Moral Decay, Pat O'Conner, Ped, Ramirez Drugs, Roger Clemens, Sammy Sosa, Sports, Steroids, Steroids In Baseball.